The British Insurance Brokers' Association (Biba) said that anyone who thinks their European Health Insurance Card (EHIC) will offer them adequate protection for winter sports is misguided. Brits who carry the card are guaranteed access to local public service healthcare within the European Economic Area or Switzerland. But as Biba spokesman Graeme Trudgill explained, most facilities located near to ski slopes are privately run, meaning treatment for life-or-death accidents will often not be covered. "On the ski slopes, you are not going to have much success with your EHIC because they are all private medical centres so you are going to be lumbered with a bill," he explained. "You won't be able to claim it on your European Health Insurance Card so that's going to be expensive as well. You're going to have to pay a private bill." 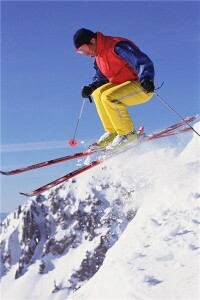 According to the Foreign and Commonwealth Office, ski slopes are one of the top five locations where holiday injuries occur.